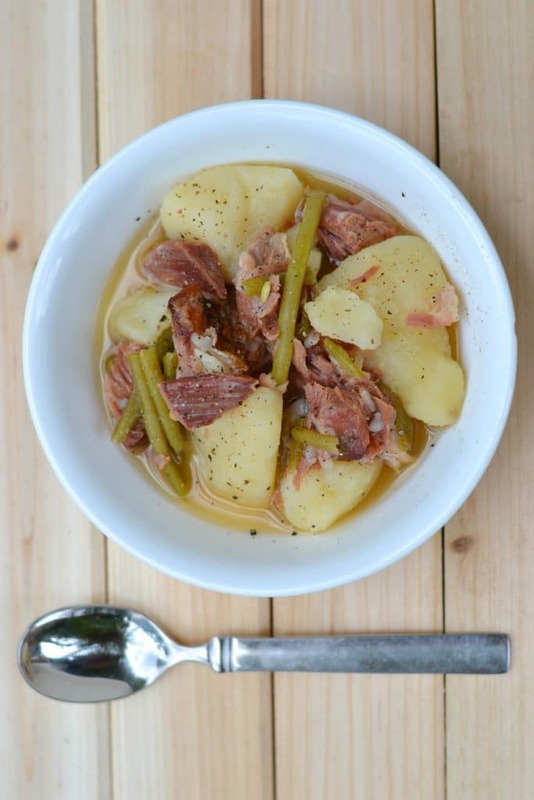 You’d never guess there were so few ingredients given the amazingly salty, smoky, hammy flavor of the broth; but the flavor is simply the result of the ham hocks cooking low and slow in water. The trickiest part about making this recipe is finding the right kind of ham hock. What is a ham hock? A ham hock comes from the lower leg of a pig. There’s not a lot of meat on a ham hock, but this portion of a pig lends a distinct “umami” flavor to anything it’s cooked with, and creates a delicious broth when cooked low and slow in water. Ideally you want to look for a meaty ham hock so that you can separate out a decent amount of meat to include in your dish. Good ham hocks should be readily available in farm-rich places (like Pennsylvania, where I grew up), but if you live in a really urban area they might be harder to come by. I managed to find some good ham hock (boneless even!) at H.E.B. here in Houston, and I’ve had luck at other large grocery store chains as well. If you’re having trouble finding a quality ham hock where you live, you can always ask a friendly butcher for some advice. Another nice thing about ham hocks is that they’re cheap! So if you find some, you should stock up and store any extras in the freezer. 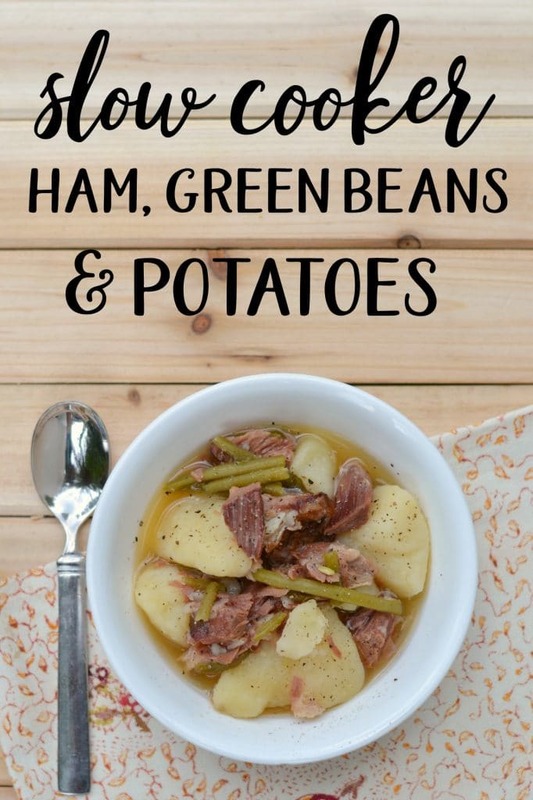 I cook my ham, green beans, and potatoes in a slow cooker, so I wrote the recipe accordingly, but you can easily make this in a big soup pot or dutch oven on the stove as well. **Just note that if you do a stovetop variation, you’ll want to cut the cooking time by about half since the stove simmering process takes less time. 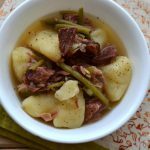 As the recipe indicates, you don’t want to add everything to the slow cooker at the same time because the ham hock takes longer to cook than the potatoes and green beans. So while this is an easy recipe, it’s not a “set it and forget it” type of slow cooker meal. I like to cook this meal over the course of two days. DAY ONE: I slow cook the ham hocks all day to create the flavorful broth. Once the broth has cooled, I place it in the refrigerator over night. This way, the fat rises to the top of the broth and can be easily skimmed off and removed in the morning. DAY TWO: I return the skimmed broth to the slow cooker and add the potatoes & green beans, along with the ham meat pulled from the bones. If you’re in a hurry, you can do this part on the stovetop instead. If you end up with a ham hock that doesn’t have a lot of meat, you may want to add some additional ham. Purchase a ham steak, cube it up, and add it to the slow cooker at the end of the cooking process. Since it’s already cooked, it just needs to be warmed up in the broth before it’s ready to eat. 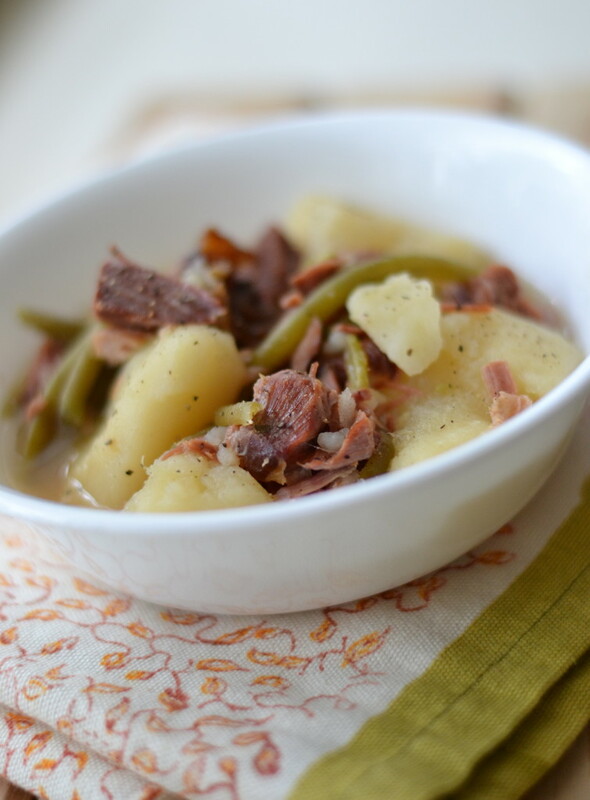 Simmer ham hocks, green beans and potatoes together in the slow cooker until your whole house smells amazing. Place the ham hocks into a crock pot and cover with water. Cook on high for approximately 5 hours, or until meat is super tender. Remove the meat from the crockpot with tongs, remove and discard any fat and bones, and return the meat to the broth. About 2-3 hours before you plan to eat, add the potatoes and green beans to the crockpot, adding more water if necessary. On day one, cover ham hocks with water and cook on high for 5 or more hours. Remove ham hocks to a bowl. Allow broth to cool, and then refrigerate overnight. In the morning, skim the fat from the top of the broth. Remove the meat from the ham hocks and add to the broth. 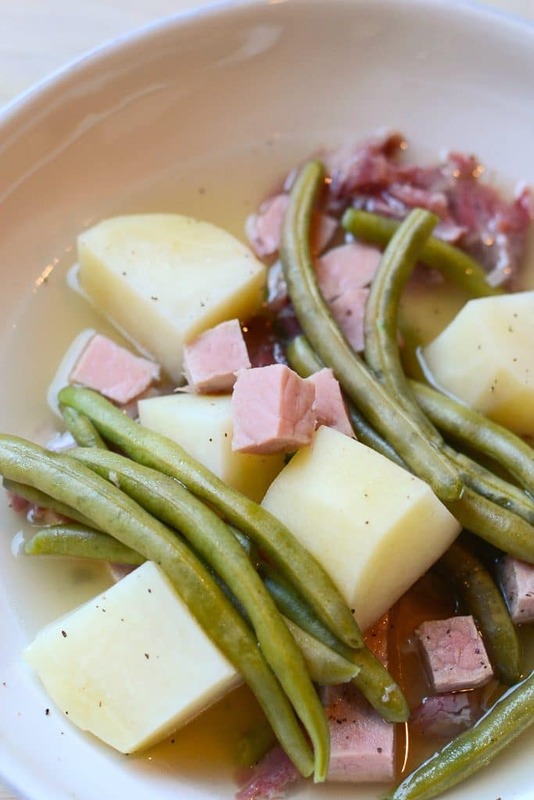 Add broth, ham meat, diced potatoes and green beans to the broth and slow cook for 3 hours, or until vegetables are tender. Cubed ham steak or additional ham can be added after the cooking process if your ham hocks are not very meaty. Exactly how much water should be added to the crock pot? I covered the ham hocks with water but it seems like a lot of broth.